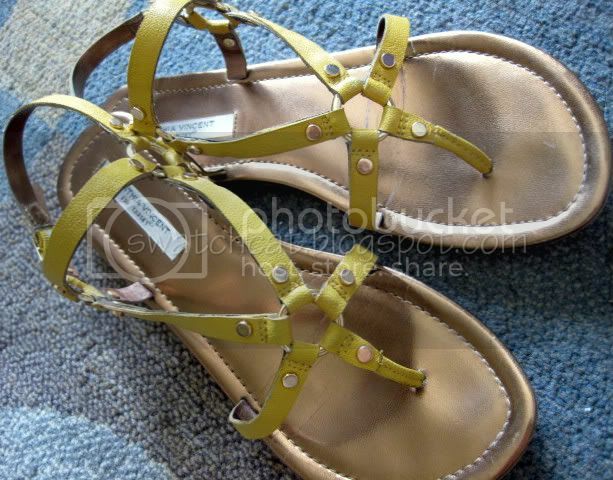 Initially I saw these Cynthia Vincent for Target sandals and didn't really think anything of them. But then I saw them on a friend of mine, and was surprised at how cute they were! I, of course, rushed out to find them. I didn't set out to get the exact color my friend had, but the marigold yellow was just too cute. Plus, I didn't own anything in yellow. Plus, the leather straps are just so soft and supple, which equals extremely comfortable. And the marigold yellow color goes with everything, a pseudo-neutral, as it's called. swatchcat C approves of these adorable sandals! All that, and I got 'em for under $7! Gotta love Target sales! I'm pretty sure the whole CV for Target line is on sale right now, and there were a couple of other cute styles and pretty colors (like pink and white) available. For the price and quality, I highly recommend snagging a pair (or two! ), if you can. Those are cute, I need to check my target!